Spotted in Burnley this week. A tribute to a legend Sean Dyche, the manager who got us into the Premier League twice. One of Burnley FC’s greats. Burnley FC will be given a victory parade today around Burnley. Unfortunately I will be elsewhere but I noticed that the Mechanics Institute has put up the same banner as last time the team got promoted. So apologies for recycling an old photo, but here we go again! 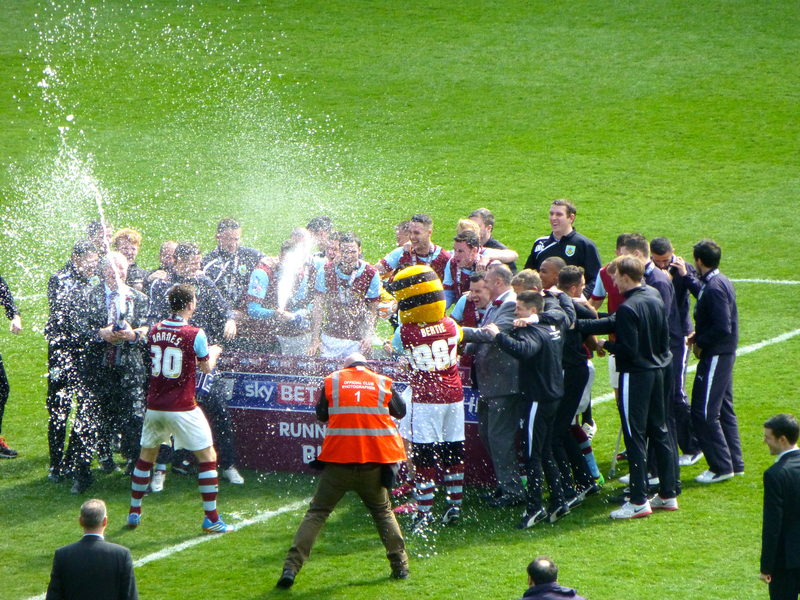 In the final game of their Championship season Burnley finished as champions by beating Charlton Athletic 3-0. Sam Vokes gave Burnley the lead at Charlton in the 20th minute with his 16th goal of the season. George Boyd scored early in the second half followed by Andre Gray, his 25th of the season (23 for Burnley). Burnley increased their unbeaten run to 23 games, against every other team, a post-war record – and kept their 20th clean sheet of the season. In fact the stats mirror their last promotion; 26 wins, 15 draws and 5 losses with 93 points. Dean Marney made his 200th appearance for the clarets, and Michael Duff went on as a late substitute and wore the captain’s armband, probably his last appearance for the clarets. What a class act Joey Barton turned out to be taking stick in every game , and how vital were Michael Keane‘s late equalisers against our two main rivals Brighton and Middlesbrough? So after getting promotion via the playoffs, then as runners-up to Leicester, Burnley now go up as worthy champions , the first time since 1973. Burnley clinched promotion to the Premier League today after beating QPR 1-0 at Turf Moor and extending their unbeaten run to 22 games. It was an edgy first half with the visitors thwarted on 5 occasions by goalkeeper and captain Tom Heaton, who deservedly got the man-of-the-match award. The second half was a different matter and whatever manager Sean Dyche said in the dressing room paid off. The goal came in the 61st minute when Sam Vokes headed David Jones free kick into the net for his 14th of the season. Burnley thought they had doubled the score a short time later but it was disallowed. Just as well that QPR could only hit the post after that. With the other promotion contenders Middlesborough and Brighton only able to draw this weekend and playing each other next week it meant Burnley were promoted. Not champions yet but that’s a possibility in their last game next week away at Charlton. 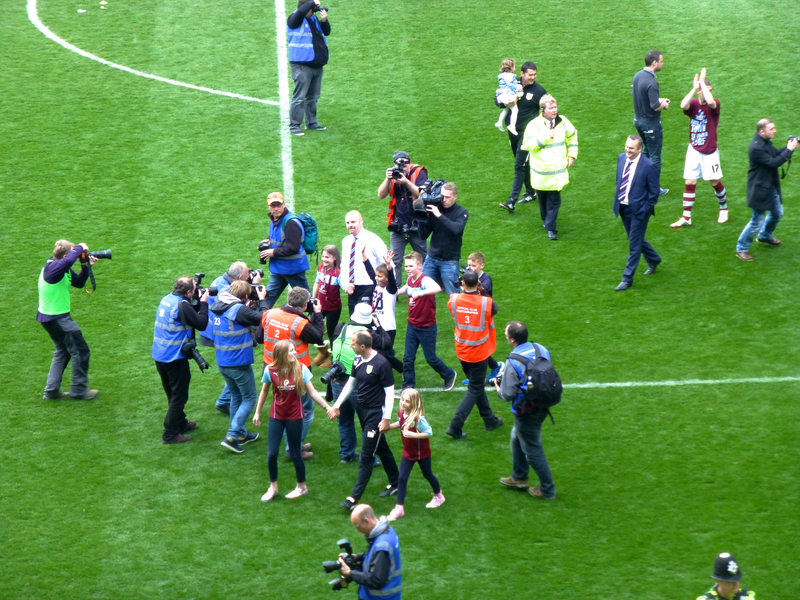 As is traditional at the last home game of the season the manager and players come out onto the pitch to show the supporters their appreciation. As usual this is preceded by a pitch invasion! This is the 3rd time Burnley have been in the Premier League and the second time under manager Sean Dyche (pictured above) who was appointed in 2012. They were first promoted via the playoffs in 2009 when they beat Sheffield United 1-0 at Wembley through a stunning Wade Elliott goal. That after 33 years in the lower divisions. That was something I thought I’d never see in my lifetime and I only went to Wembley because my two sons dragged me there. We didn’t survive the season and had to wait until 2014 when we were promoted again as runners-up to Leicester City. This weekend’s opposition QPR also went up via the playoffs. Again we only survived one season fighting relegation with QPR and Leicester (crowned Premier League champions today) at one stage. So to go straight back up is remarkable. It shows a lot about the team spirit and resilience that Sean Dyche has inculcated in the team in which he used only 25 players. Burnley’s aim next season must surely be to stay in the Premier League. FYI Burnley was a founder member of the Football League in 1888 and adopted claret and blue to emulate the top English team at the team, Aston Villa, now a shadow of its former self. The home ground since 1883 has been Turf Moor and it is the longest continuously professionally used football ground in the world with a natural turf and the longest in the top tier in the world. Yes it’s not Belfast but an old industrial town in Lancashire. The occasion? The local derby with hated rivals Blackburn Rovers from just 15 miles down the road. Although Burnley has won the last three games and drawn the 3 before that it’s their first home win and double against the Rivers since 1978. Burnley FC, the team that against all odds gained promotion to the Premier League this season, had to wait until Monday night for their first game due to TV scheduling. And their first game was against the team seen as likely champions – Chelsea. The game didn’t end well for Burnley who lost 3-1 to a taller, heavier, more skilful – and richer team. Chelsea have spent more on transfers in the Summer (and more than any other club in the last 10 years) than Burnley have ever spent in their existence since 1888! Chelsea are also the club with the biggest debts but are bank-rolled by a Russian oligarch who made his billions in energy supplies and has remained on Putin’s good side. So onward and hopefully upward this weekend at Swansea! 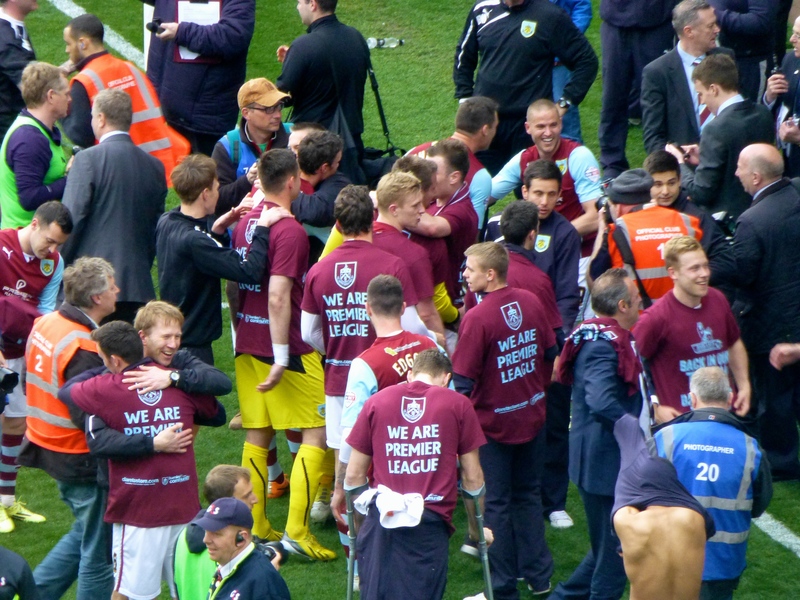 Last week Burnley FC secured promotion to the Premier league by beating Wigan Athletic at Turf Moor. This weekend they beat Ipswich, who needed to win to gain a play-off place, and after the game received the trophy and well deserved medals. The crowd were introduced to the back room staff and players as they came out of the tunnel before they posed for the press and opened a few bottles of bubbly. Burnley has probably the smallest squad in the championship having used only 23 players with only one bought and one on loan all season. And don’t forget they went a whole year without losing at Turf Moor and had the best defensive record in their division. 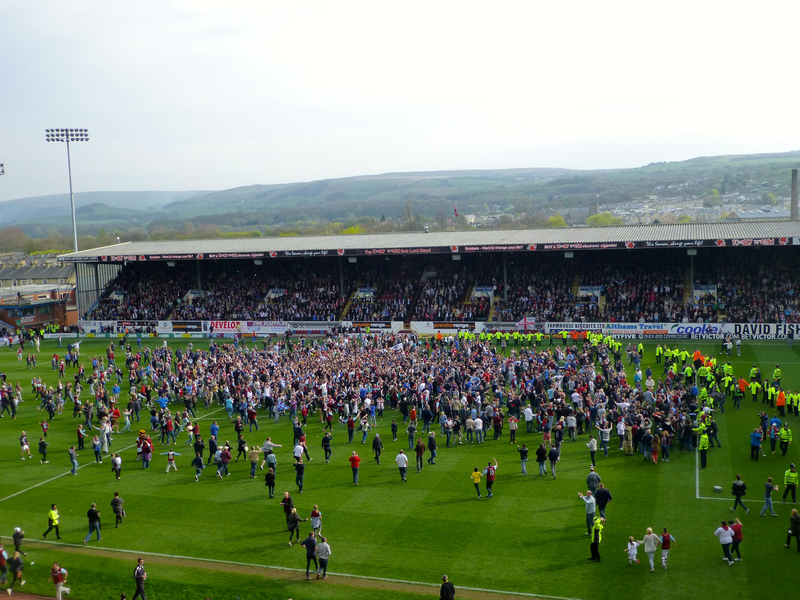 Burnley Football team was promoted to the Premier League today. 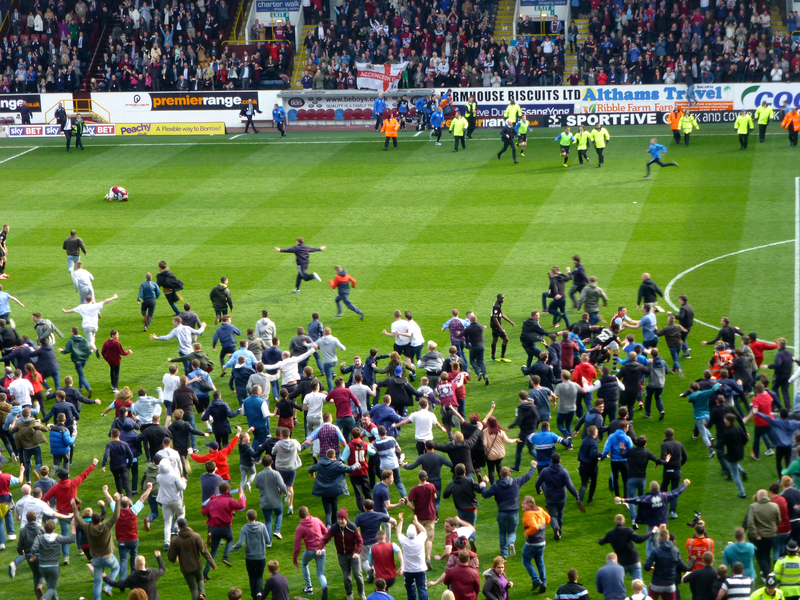 The picture above was taken as the final whistle blew on a 2-0 defeat of FA Cup winners Wigan Athletic at Turf Moor. The manager Sean Dyche takes the applause from an ecstatic crowd. Promotion to the Premier League is something I thought I’d never see in my lifetime. A small town club, albeit one of the founder members of the football league, competing against millionaire players at foreign-owned clubs with one of the smallest squads around. Burnley did it in 2009 via the playoffs and did it in fine style this time going unbeaten at home for over a year in the process and having the best defensive record in the division.